There was no lack of excitement in the last round games. The round ended with change at the leadership position, favorites losing the games and games ending by tiny margin. Here is the last round review presented by ESL. The most important game of round 6 took place in McKinnon between two undefeated teams of League where Cougars crushed Magic (4-1) 115-94 on Sunday night. It was a key game for the top position in League. Cougars looked well-organized offensively handing out 21 assists. 25 personal fouls committed by Magic helped opponents get some easy free throw opportunities. Americans were the main players on the court. Forward Dillon Stith (200-92, college: St.Vincent) scored 30 points and 8 rebounds to lead the charge for the winners and forward Eric Williams (198-85, college: Tarleton St.) chipped in 19 points and 15 rebounds during the contest. The best for the losing side was power forward Michael Phillips (201-90, college: Howard) with a double-double by scoring 24 points and 12 rebounds. The winner was already known earlier in the game, so both coaches allowed to play the bench players saving starting five for next games. Cougars (5-0) keep a position of League leader. Magic at the other side dropped to the third place with one game lost. They were replaced at the leadership position by Joondalup W.. Magic will play next round against strong Cavaliers trying to make it back to the top of the standings. Cougars will try to continue on its current victory against sixth ranked Hume City Broncos in Tullamarine. The most crucial game of the last round was the first loss of undefeated Huskies (1-1) in Hobart. Hosts were rolled over by Spectres (3-1) 93-72. American center Dain Swetalla (206-86, college: Augustana, IL) notched 22 points and 9 rebounds to lead the effort and Thomas Wright supported him with 24 points and 5 assists. Even 9 points and 8 rebounds by American guard Jalen Adams (196, college: Olivet) did not help to save the game for Huskies. Huskies' coach gave up on the game allowing to play eleven players seeing no chance for a win. Spectres keep a position of League leader. Newly promoted Huskies dropped to the tenth place with one game lost. Spectres will play against Eltham Wildcats (#8) at home in the next round and are hoping to win another game. Huskies will play against NW Tasmania Thunder and it may be a tough game between close rivals. Quite upsetting was Eagles' home defeat in a game versus Giants 120-110. The best player for the winners was Jay Bowie who scored 36 points (!!!) and 9 rebounds. At the other side the best for losing team was Cameron Williams who recorded 28 points. Both coaches used bench players which allowed the starters a little rest for the next games. Giants maintains third position in League with 4-2 record behind leader Joondalup W. Loser Eagles dropped to the ninth place with three games lost. Giants will meet at home Flames (#5) in the next round. Eagles will play against Slammers (#14) and hope to secure a win. A very interesting game took place in Melbourne. It ended with only one-point home defeat of bottom-ranked Vikings (0-5) to seventh ranked Devils (1-5) 99-98 in the fight for the eighth place. It was a good game for Konor Kulas who saved his team from a defeat with a double-double by scoring 29 points, 15 rebounds and 5 assists. Vikings' coach rotated ten players in this game, but that didn't help. Despite that victory Devils went down to eighth position (League) due to points difference. Vikings at the other side still closes the standings with five games lost. Devils will have a break next round. Vikings will play on the road against Stingrays (#7) in Geelong and hope to get finally their first victory. Very important is a road loss of first ranked Norwood Flames (6-1) against ninth ranked Woodville Warriors (2-4) on Saturday night. Visiting Norwood Flames were defeated by Woodville Warriors in a tough game in Flinders Park 97-106. Alex Maiorana had a double-double by scoring 23 points and 15 rebounds to lead the charge for the winners. Woodville Warriors maintains ninth position in League with 2-4 record. Loser Norwood Flames still keep top place with one game lost. Woodville Warriors will face Sturt Sabres (#11) in Pasadena in the next round. Norwood Flames will play at home against the league's second-placed Forestville Eagles (#2) where they are definitely not considered as a favorite in this game either. In League McKinnon C. destroyed Corio Bay S. on the opponent's court 117-86. Hawthorn M. managed to outperform Keilor T. in a home game 85-79. Corio Bay S. rolled over Werribee D. on the road 114-85. Casey C. defeated Chelsea G. on its own court 115-107. Hume City was beaten by Keilor T. in Melbourne 94-86. Bendigo B. lost to BA CoE at home 72-87. Ringwood H. lost to undefeated Albury W.B. on the opponent's court 100-105. Ballarat M. managed to beat Bendigo B. in a home game 94-86. BA CoE defeated Diamond V.E. on the road 86-84. Eltham W. was beaten by Waverley F. on its own court 84-89. Winless Knox R. lost to Geelong S. in a road game 72-88. NW Tasmania unfortunately lost to Nunawading S. at home 79-92. Dandenong R. managed to beat Sandringham S. on the opponent's court 90-83. Dandenong R. defeated Diamond V.E. in a home game 81-76. Winless Frankston B. was beaten by Melbourne T. on the road 102-91. N.Adelaide R. won against Eastern M. on its own court 109-102. Winless S.Adelaide P. was outscored by Mt Gambier in a road game 121-84. W.Adelaide B. lost to undefeated Forestville E. at home 76-89. Southern T. defeated C.District L. on the opponent's court 84-74. Perth R. beat Rockingham F. in a home game 96-93. Mandurah M. was destroyed by Perry Lakes H. on the road 120-73. Lakeside L. lost to undefeated Joondalup W. on its own court 70-89. Winless SW Slammers was rolled over Kalamunda E.S. in a road game 88-108. Willetton T. crushed East Perth E. at home 110-88. Winless Cockburn C. was smashed by Geraldton B. on the opponent's court 107-68. Winless SW Slammers lost to Perth R. in a home game 84-91. Willetton T. unfortunately lost to Warwick S. on the road 80-89. Rockingham F. managed to beat Goldfields G. on its own court 96-91. Winless Hornsby S. was defeated by Penrith P. in a road game 88-77. Cent.Coast C. smashed Newcastle H. at home 92-62. Manly Warr. won against Sutherland S. on the opponent's court 83-73. Sydney Comets managed to outperform Hills H. in a home game 88-71. Norths Bears rolled over Canberra G. on the road 100-53. Winless Hornsby S. was defeated by Manly Warr. on its own court 64-79. Bankstown B. was beaten by Maitland M. in a road game 90-79. The most impressive stats of the last round was 21 points, 15 rebounds and 5 assists by Dane Pineau of Melbourne T.. Very expected game in Geelong where 8th ranked Stingrays (1-4) were crushed by top-ranked Cougars (5-0) 117-86 on Saturday. Stingrays were plagued by 29 personal fouls down the stretch. American forward Eric Williams (198-85, college: Tarleton St.) had a double-double by scoring 21 points, 11 rebounds and 4 assists to lead the charge for the winners and the other American import forward Dillon Stith (200-92, college: St.Vincent) chipped in 24 points and 6 rebounds during the contest. The best for the losing side was American center Joe Reid (205-91, college: Shaw) with a double-double by scoring 19 points and 11 rebounds and guard Dane Bow (187-88) scored 18 points. Both teams had four players each who scored in double figures. Since the result was very predictable, it gave the chance for the coaches to test many bench players and allowed the starting five to rest. Cougars keep a position of League leader. Loser Stingrays dropped to the seventh place with four games lost. Cougars will face Hume City Broncos (#6) in Tullamarine in the next round where they are favorite. Stingrays will play at home against Vikings and it may be a tough game between close rivals. Rather predictable result in Hawthorn where first ranked Magic (4-1) defeated one of their biggest challengers Thunder (4-2) 85-79 on Saturday. American guard Nelson Kirksey (190-89, college: UMKC) scored 19 points and 7 rebounds to lead the charge for the winners and forward Alex Bogart-King (200) chipped in 18 points and 5 rebounds during the contest. Five Magic players scored in double figures. Magic's coach used a ten-player rotation and allowed the starting five to rest. The best for the losing side was American forward Christopher Kaba (203-88, college: N.Colorado) with 28 points and 8 rebounds and his fellow American import guard Mike Anderson (193-91, college: Washington) produced a double-double by scoring 15 points and 16 rebounds. Despite that victory Magic went down to third position (League) due to points difference. Loser Thunder keeps the fourth place with two games lost. Magic will face league's second-placed Cavaliers in Cranbourne in the next round and it will be for sure the game of the week. Thunder's supporters look forward to an exciting derby game next round, where their team will face at home their local rival from Melbourne Gulls. A very interesting game took place in Melbourne. It ended with only one-point home defeat of bottom-ranked Vikings (0-5) to seventh ranked Devils (1-5) 99-98 in the fight for the eighth place. Devils made 17-of-19 charity shots (89.5 percent) during the game. It was a good game for American forward Konor Kulas (201-94, college: S.Dakota Mines) who saved his team from a defeat with a double-double by scoring 29 points, 15 rebounds and 5 assists. Maltese guard Jacob Formosa (188-97) contributed with 24 points, 7 rebounds and 4 assists for the winners. Four Devils players scored in double figures. Canadian guard Ryan Bennett (193, college: Brock) replied with 23 points, 5 rebounds and 4 assists and guard Jake Heath (185, college: S.Dakota Mines) added 19 points and 8 assists in the effort for Vikings. Vikings' coach rotated ten players in this game, but that didn't help. Despite that victory Devils went down to eighth position (League) due to points difference. Vikings at the other side still closes the standings with five games lost. Devils will have a break next round. Vikings will play on the road against Stingrays (#7) in Geelong and hope to get finally their first victory. We cannot really consider it an upset in the game between close teams in Werribee where 7th ranked Devils (1-5) were rolled over by eighth ranked Stingrays (1-4) 114-85 on Sunday. It was a great shooting night for Stingrays especially from behind the arc, where they had solid 64.3 percentage. Devils were plagued by 25 personal fouls down the stretch. American center Joe Reid (205-91, college: Shaw) had a double-double by scoring 35 points (!!!) and 12 rebounds to lead the charge for the winners and the other American import guard Ivory Young (190-95, college: Utah Valley) chipped in 14 points during the contest. Stingrays' coach felt very confident that he used entire bench and allowed the starting five to rest. The best for the losing side was American David Shepard (201-94, college: Lindenwood-Bellev.) with 23 points and 5 rebounds and forward Mark Berezdecky (198-93) scored 15 points and 9 rebounds. Four Stingrays and five Devils players scored in double figures. Stingrays left bottom position moving up to seventh place in League. Loser Devils dropped to the eighth position with five games lost. Stingrays will face Vikings (#9) in Melbourne in the next round. There was a change at the State League leadership position after last games. The most important game of round 6 took place in McKinnon between two undefeated teams of League where Cougars crushed Magic (4-1) 115-94 on Sunday night. It was a key game for the top position in League. Cougars looked well-organized offensively handing out 21 assists. 25 personal fouls committed by Magic helped opponents get some easy free throw opportunities. Americans were the main players on the court. Forward Dillon Stith (200-92, college: St.Vincent) scored 30 points and 8 rebounds to lead the charge for the winners and forward Eric Williams (198-85, college: Tarleton St.) chipped in 19 points and 15 rebounds during the contest. The best for the losing side was power forward Michael Phillips (201-90, college: Howard) with a double-double by scoring 24 points and 12 rebounds and guard Nelson Kirksey (190-89, college: UMKC) scored 23 points, 5 rebounds and 4 assists. Five Cougars and four Magic players scored in double figures. The winner was already known earlier in the game, so both coaches allowed to play the bench players saving starting five for next games. Cougars (5-0) keep a position of League leader. Magic at the other side dropped to the third place with one game lost. They were replaced at the leadership position by Joondalup W.. Magic will play next round against strong Cavaliers trying to make it back to the top of the standings. Cougars will try to continue on its current victory against sixth ranked Hume City Broncos in Tullamarine. Everything went according to plan in Cranbourne where third ranked Cavaliers (4-1) beat 5th ranked Gulls (2-2) 115-107 on Sunday. Cavaliers made 17-of-19 free shots (89.5 percent) during the game. Brandon Polk had a double-double by scoring 21 points and 15 rebounds (on 10-of-13 shooting from the field) to lead the charge for the winners and guard Michael McInnes (189-90) chipped in 28 points (went 8 for 8 at the free throw line) during the contest. Five Cavaliers players scored in double figures. The best for the losing side was Matthew Brasser with 46 points (!!!) and guard Mitchell Riggs (196-93, college: Newberry) scored 30 points and 5 rebounds. Gulls' coach tested ten players, but that didn't help to avoid defeat in this game. Cavaliers moved-up to second place in League. Loser Gulls keep the fifth position with two games lost. Cavaliers will face Magic (#3) in Hawthorn in the next round, which may be the game of the day. Gulls' supporters look forward to an exciting derby game next round, where their team will travel locally in Melbourne to the arena Thunder. There was no surprise in Melbourne where 6th ranked Hume City Broncos (2-3) were defeated by fourth ranked Thunder (4-2) 94-86 on Sunday. Thunder dominated down low during the game scoring 58 of its points in the paint compared to Hume City Broncos' 38. They outrebounded Hume City Broncos 49-36 including 16 on the offensive glass. Thunder looked well-organized offensively handing out 24 assists comparing to just 11 passes made by Hume City Broncos' players. Hume City Broncos were plagued by 26 personal fouls down the stretch. American guard Mike Anderson (193-91, college: Washington) had a double-double by scoring 10 points, 16 rebounds and 6 assists to lead the charge for the winners and the other American import forward Christopher Kaba (203-88, college: N.Colorado) chipped in 19 points and 6 rebounds during the contest. Thunder's coach used a ten-player rotation and allowed the starting five to rest. The best for the losing side was American guard Jordan Coleman (196-92, college: Valpo) with a double-double by scoring 22 points and 10 rebounds and naturalized American forward Jake Martin (198-93, college: Luther) produced a double-double by scoring 15 points, 10 rebounds and 4 assists. Five Thunder and four Hume City Broncos players scored in double figures. Thunder maintains fourth position in League with 4-2 record. Loser Hume City Broncos keep the sixth place with three games lost. Thunder's supporters look forward to an exciting derby game next round, where their team will face at home their local rival from Melbourne Gulls. No shocking result in a game when third ranked BA CoE (3-2) won against on the road 9th ranked Bendigo Braves (1-2) 87-72 on Friday. BA CoE made 25-of-32 free shots (78.1 percent) during the game, while Bendigo Braves only scored six points from the stripe. Alex Ducas scored 23 points and 6 rebounds to lead the charge for the winners and forward Kyle Bowen (203-0) chipped in 10 points, 11 rebounds and 6 assists during the contest. Four BA CoE players scored in double figures. The best for the losing side was American forward Ray Turner (206-90, college: Texas A&M) with a double-double by scoring 18 points and 16 rebounds and the former international power forward Matthew Andronicos (208-91) scored 12 points and 6 rebounds. Both coaches tested many bench players and allowed the starting five to rest. BA CoE moved-up to second place in League. Loser Bendigo Braves dropped to the fourteenth position with two games lost. BA CoE will have a break next round. Bendigo Braves will play on the road against Kilsyth Cobras (#5) and hope to win that game. The most crucial game of the last round was the first loss of undefeated Huskies (1-1) in Hobart. Hosts were rolled over by Spectres (3-1) 93-72. American center Dain Swetalla (206-86, college: Augustana, IL) notched 22 points and 9 rebounds to lead the effort and Thomas Wright supported him with 24 points and 5 assists. Even 9 points and 8 rebounds by American guard Jalen Adams (196, college: Olivet) did not help to save the game for Huskies. Jacob Richards (-1) added 15 points. Huskies' coach gave up on the game allowing to play eleven players seeing no chance for a win. Spectres keep a position of League leader. Newly promoted Huskies dropped to the tenth place with one game lost. Spectres will play against Eltham Wildcats (#8) at home in the next round and are hoping to win another game. Huskies will play against NW Tasmania Thunder and it may be a tough game between close rivals. Everything could happen in Albury at the game between two tied teams. Both top-ranked Bandits and 8th ranked Ringwood Hawks had identical 1-0 record. This time Bandits used a home court advantage and beat the opponent from Heathmont 105-100 on Saturday night. However just five-point win is not that big difference and the fans of host team counted on more convincing victory. American guard Ken-Jah Bosley (185, college: Ky Wesleyan) scored 37 points (!!!) and 7 rebounds to lead the charge for the winners and point guard Deba George (183-85) chipped in 24 points, 7 rebounds and 8 assists during the contest. The best for the losing side was American guard Jacob Gibson (198-93, college: Harding) with 21 points and 9 rebounds and his fellow American import guard Joey Miller (190-92, college: DBU) scored 21 points and 6 assists. Four Bandits and five Ringwood Hawks players scored in double figures. Bandits (2-0) moved-up to third place in League. Loser Ringwood Hawks dropped to the thirteenth position with one game lost. Bandits will face Diamond Valley Eagles (#17) in Greensborough in the next round which should be an easy win for them. Ringwood Hawks will play at home against Kilsyth Cobras (#5) and hope to win that game. Rather predictable result in Wendouree where top-ranked Ballarat Miners (2-0) defeated 9th ranked Bendigo Braves (1-2) 94-86 on Saturday. Guard Kuany Kuany (201-94, college: Chaminade) scored 21 points, 6 rebounds and 5 assists to lead the charge for the winners and guard Sam Short (195-98) chipped in 24 points during the contest. Five Ballarat Miners players scored in double figures. The best for the losing side was American point guard Deonte Burton (183-91, college: Nevada) with 30 points and 6 assists (went 9 for 9 at the free throw line !!!) 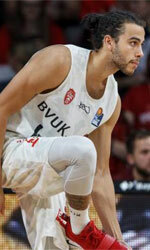 and his fellow American import forward Ray Turner (206-90, college: Texas A&M) scored 21 points and 6 rebounds. Both coaches tested many bench players and allowed the starting five to rest. Ballarat Miners moved-up to fourth place in League. Loser Bendigo Braves dropped to the fourteenth position with two games lost. Ballarat Miners will face Dandenong Rangers (#6) on the road in the next round. Bendigo Braves will play against Kilsyth Cobras (#5) and hope to win that game. Not a big story in a game in Greensborough where bottom-ranked Diamond Valley Eagles (0-3) were edged by third ranked BA CoE (3-2) 86-84 on Saturday. Great defensive blocking was one of the keys in this match when BA CoE made 7 blocks. Forward Hunter Goodrick (201-0) had a double-double by scoring 19 points, 13 rebounds and 4 assists to lead the charge for the winners and Alex Ducas chipped in 29 points during the contest. The best for the losing side was center Ben Allen (211-86, college: St.Mary's, CA) with a double-double by scoring 20 points, 10 rebounds and 4 assists and L Thomas produced a double-double by scoring 15 points and 12 rebounds. Both teams had four players each who scored in double figures. BA CoE moved-up to second place in League. Loser Diamond Valley Eagles still closes the standings with three games lost. BA CoE will have a break next round. Diamond Valley Eagles will play on the road against Bandits (#3) in Albury and look forward to get finally their first victory. There was a surprise result when eleventh ranked Waverley Falcons (2-1) beat on the road higher ranked Eltham Wildcats (1-1) 89-84 on Saturday. American forward Deondre McWhorter (203-93, college: Georgetown, KY) had a double-double by scoring 27 points and 14 rebounds to lead the charge for the winners and the other American import guard Dylan Travis (190-93, college: Florida Southern) chipped in 19 points, 6 rebounds and 4 assists during the contest. The best for the losing side was Canadian forward Grandy Glaze (204-92, college: GCU) with 17 points, 6 rebounds and 5 assists and point guard Adam Doyle (176-91) scored 18 points and 5 assists. Four Eltham Wildcats players scored in double figures. Eltham Wildcats' coach tested ten players, but that didn't help to avoid defeat in this game. Waverley Falcons moved-up to seventh place in League. Loser Eltham Wildcats dropped to the eighth position with one game lost. Waverley Falcons will face Tigers (#11) in Melbourne in the next round. Eltham Wildcats will play on the road against the league's leader Spectres where they are definitely not considered as a favorite in this game either. Everything could happen at the game between two tied teams. Both fifteenth ranked Geelong Supercats and bottom-ranked Knox Raiders had identical 0-1 record. This time Geelong Supercats used a home court advantage and defeated the opponent from Wantirna South 88-72 on Saturday night. Geelong Supercats dominated down low during the game scoring 58 of its points in the paint compared to Knox Raiders' 34. Geelong Supercats looked well-organized offensively handing out 22 assists. Great defensive blocking was one of the keys in this match when Geelong Supercats made 9 blocks. American guard Demarcus Gatlin (193, college: SHSU) had a double-double by scoring 20 points, 10 rebounds and 5 assists to lead the charge for the winners and naturalized British forward Lewis Thomas (203-92, college: W.Oregon) chipped in 22 points, 10 rebounds and 5 blocks during the contest. The best for the losing side was American forward Cadarian Raines (206-90, college: Virginia Tech) with a double-double by scoring 18 points, 12 rebounds and 4 assists and A Thoseby scored 12 points and 6 assists. Both coaches tested many bench players and allowed the starting five to rest. Geelong Supercats (1-1) left bottom position moving up to ninth place in League. Loser Knox Raiders still closes the standings with two games lost. Geelong Supercats will face Frankston Blues (#15) in Seaford in the next round where they are favorite. Knox Raiders will play at home against Tigers and look forward to get finally their first victory. No shocking result in a game in Ulverstone where second ranked Spectres (3-1) won against 7th ranked NW Tasmania Thunder (1-1) 92-79 on Saturday. They outrebounded NW Tasmania Thunder 42-31 including a 33-21 advantage in defensive rebounds. Power forward Simon Conn (206-83, college: Gardner-Webb) had a double-double by scoring 22 points and 17 rebounds to lead the charge for the winners and American center Dain Swetalla (206-86, college: Augustana, IL) chipped in 23 points and 13 rebounds during the contest. The best for the losing side was American forward Nick Banyard (203-94, college: Cent Florida) with 18 points and 6 rebounds and point guard Lachlan Dent (184-0) scored 15 points. Five Spectres and four NW Tasmania Thunder players scored in double figures. NW Tasmania Thunder's coach tested ten players, but that didn't help to avoid defeat in this game. Spectres keep a position of League leader. Loser NW Tasmania Thunder dropped to the twelfth place with one game lost. Spectres will face Eltham Wildcats (#8) at home in the next round and are hoping to win another game. NW Tasmania Thunder will play against Huskies (#10) in Hobart and it may be a tough game between close rivals. Very expected game in Cheltenham where bottom-ranked Sabres (0-3) were defeated by seventh ranked Dandenong Rangers (2-1) 90-83 on Saturday. Center Samson Froling (210-0, college: Creighton) had a double-double by scoring 17 points and 12 rebounds to lead the charge for the winners and point guard Lucas Barker (183-93, college: Indianapolis) chipped in 19 points and 5 assists during the contest. The best for the losing side was the former international forward David Barlow (205-83, college: MSU Denver) with a double-double by scoring 22 points, 10 rebounds and 5 assists and swingman Sam McDaniel (198-95, college: ULM) scored 14 points and 5 rebounds. Four Sabres players scored in double figures. Both coaches tested many bench players and allowed the starting five to rest. Dandenong Rangers moved-up to sixth place in League. Loser Sabres still closes the standings with three games lost. Dandenong Rangers will face higher ranked Ballarat Miners (#4) in Wendouree in the next round and it may be quite challenging game. Sabres will play at home against Knox Raiders (#16) and look forward to get finally their first victory. Very predictable result when seventh ranked Dandenong Rangers (2-1) defeated at home bottom-ranked Diamond Valley Eagles (0-3) 81-76 on Sunday. However just five-point win is not that big difference and the fans of host team counted on more convincing victory. Center Samson Froling (210-0, college: Creighton) scored 24 points and 9 rebounds to lead the charge for the winners and center Timothy Lang (206-85, college: Stetson) chipped in 15 points and 11 rebounds during the contest. Four Dandenong Rangers players scored in double figures. The best for the losing side was center Ben Allen (211-86, college: St.Mary's, CA) with a double-double by scoring 14 points and 10 rebounds and guard Joel Spear (192-94, college: S.Oregon) scored 13 points, 5 rebounds and 4 assists. Both coaches tested many bench players in such tough game. Dandenong Rangers moved-up to sixth place in League. Loser Diamond Valley Eagles still closes the standings with three games lost. Dandenong Rangers will face higher ranked Ballarat Miners (#4) in Wendouree in the next round and it may be quite challenging game. Diamond Valley Eagles will play on the road against Bandits (#3) in Albury and look forward to get finally their first victory. Everything could happen in Melbourne at the game between two tied teams. Both fifteenth ranked Tigers and bottom-ranked Frankston Blues had identical 0-1 record. This time Tigers used a home court advantage and won against the opponent from Seaford 102-91 on Sunday night. Tigers looked well-organized offensively handing out 24 assists. Naturalized Greek forward Nic Pozoglou (198-96) scored 25 points, 9 rebounds and 9 assists to lead the charge for the winners and the former international forward Dane Pineau (206-94, college: St.Mary's, CA) chipped in 21 points, 15 rebounds and 5 assists during the contest. Five Tigers players scored in double figures. Tigers' coach B Pineau used an eleven-player rotation and allowed the starting five to rest. The best for the losing side was American guard Damon Bozeman (190, college: Saginaw Valley) with 33 points (!!!) and 6 rebounds and the former international guard Igor Hadziomerovic (193-92, college: Boise St.) scored 23 points. Tigers (1-1) left bottom position moving up to eleventh place in League. Loser Frankston Blues still closes the standings with two games lost. Tigers will face Knox Raiders (#16) in Wantirna South in the next round where they are favorite. Frankston Blues will play at home against Geelong Supercats and look forward to get finally their first victory. Everything went according to plan in Greenacres where fourth ranked North Adelaide Rockets (4-2) beat 8th ranked Eastern Mavericks (2-4) 109-102 on Saturday. North Adelaide Rockets dominated down low during the game scoring 88 of its points in the paint compared to Eastern Mavericks' 56. North Adelaide Rockets had a 25-13 advantage in offensive rebounds. American forward Tobias Dowdell (201-90, college: Alders.-Broad.) had a double-double by scoring 29 points and 17 rebounds to lead the charge for the winners and the former international forward Jack McVeigh (203-96, college: Nebraska) chipped in 32 points and 9 rebounds during the contest. The best for the losing side was American forward Brandon Morris (203-94, college: Benedict) with 32 points and 9 rebounds and his fellow American import guard Novian Cherry (193-92, college: CS San Marcos) produced a double-double by scoring 14 points, 11 rebounds and 4 assists. Both teams had four players each who scored in double figures. Eastern Mavericks' coach tested ten players, but that didn't help to avoid defeat in this game. North Adelaide Rockets moved-up to third place in League. Loser Eastern Mavericks keep the eighth position with four games lost. North Adelaide Rockets will face Mount Gambier Pioneers (#4) in Mt Gambier in the next round. Eastern Mavericks will play at home against Noarlunga City Southern Tigers (#5) and hope to win that game. There was no surprise in Mt Gambier where bottom-ranked South Adelaide Panthers (0-5) were outplayed by sixth ranked Mount Gambier Pioneers (3-2) 121-84 on Saturday. Mount Gambier Pioneers dominated down low during the game scoring 90 of its points in the paint compared to South Adelaide Panthers' 48. Mount Gambier Pioneers forced 23 South Adelaide Panthers turnovers. They looked well-organized offensively handing out 33 assists comparing to just 14 passes made by South Adelaide Panthers' players. American swingman Kentrell Barkley (195-96, college: ECU, agency: Haylett Sports) had a double-double by scoring 18 points, 18 rebounds and 5 assists to lead the charge for the winners and the former international guard Tom Daly (182-91) chipped in 27 points, 8 assists and 5 steals during the contest. The best for the losing side was American forward Zach Allmon (203, college: Vanguard) with a double-double by scoring 22 points and 13 rebounds and Brad Jonnek scored 22 points. Both teams had four players each who scored in double figures. Since the result was very predictable, it gave the chance for the coaches to test many bench players and allowed the starting five to rest. Mount Gambier Pioneers moved-up to fourth place in League. Loser South Adelaide Panthers still closes the standings with five games lost. Mount Gambier Pioneers will face higher ranked North Adelaide Rockets (#3) in Greenacres in the next round and it may be the game of the week. South Adelaide Panthers will play on the road against Central District Lions (#6) in Gawler and look forward to get finally their first victory. No shocking result in a game in Woodville where top-ranked Forestville Eagles (5-0) won against 5th ranked West Adelaide Bearcats (3-3) 89-76 on Saturday. South Sudanese forward Majok Deng (208-93, college: ULM) had a double-double by scoring 26 points and 13 rebounds to lead the charge for the winners and Kane De-Wit chipped in 15 points, 5 rebounds, 9 assists and 5 steals during the contest. Five Forestville Eagles players scored in double figures. The best for the losing side was forward Tom Kubank (201, college: Mary) with 26 points and 6 rebounds and American forward Bryan Jefferson (201-94, college: Mary) produced a double-double by scoring 19 points and 11 rebounds. Forestville Eagles maintains second position in League with 5-0 record despite having the same number of points like the leader Joondalup W. Loser West Adelaide Bearcats dropped to the seventh place with three games lost. Forestville Eagles will face league's leader Norwood Flames in Marden in the next round and it will be for sure the game of the week. Very important is a road loss of first ranked Norwood Flames (6-1) against ninth ranked Woodville Warriors (2-4) on Saturday night. Visiting Norwood Flames were defeated by Woodville Warriors in a tough game in Flinders Park 97-106. Woodville Warriors made 16-of-21 free shots (76.2 percent) during the game. It was a great shooting night for Woodville Warriors especially from behind the arc, where they had solid 53.3 percentage. They looked well-organized offensively handing out 21 assists. Power forward Alex Maiorana had a double-double by scoring 23 points and 15 rebounds to lead the charge for the winners and guard Riley Meldrum chipped in 20 points, 6 rebounds and 6 assists during the contest. The best for the losing side was forward Brandon Brine (198-91, college: Lethbridge) with a double-double by scoring 36 points (!!! ), 17 rebounds and 4 blocks and guard Matthew Lycett (194-90) scored 16 points and 9 assists. Five Woodville Warriors and four Norwood Flames players scored in double figures. Woodville Warriors maintains ninth position in League with 2-4 record. Loser Norwood Flames still keep top place with one game lost. Woodville Warriors will face Sturt Sabres (#11) in Pasadena in the next round. Norwood Flames will play at home against the league's second-placed Forestville Eagles (#2) where they are definitely not considered as a favorite in this game either. There was an upset in Gawler where one of their biggest challengers Central District Lions (3-3) were defeated by seventh ranked Noarlunga City Southern Tigers (3-2) 84-74 on Saturday. American swingman CJ Turnage (201-95, college: Saginaw Valley) had a double-double by scoring 29 points and 18 rebounds to lead the charge for the winners and swingman Samuel Johns (193-95) chipped in 14 points and 9 rebounds during the contest. The best for the losing side was Lual Diing with a double-double by scoring 11 points and 14 rebounds and American forward DeVaughn Jones (196, college: Midwestern St.) produced a double-double by scoring 14 points and 11 rebounds. Both teams had four players each who scored in double figures. Central District Lions' coach tested ten players, but that didn't help to avoid defeat in this game. Noarlunga City Southern Tigers moved-up to fifth place in League. Loser Central District Lions dropped to the sixth position with three games lost. Noarlunga City Southern Tigers will face Eastern Mavericks (#8) in Mt. Barker in the next round. Central District Lions will play at home against South Adelaide Panthers and hope to win that game. There was a small surprise in Northbridge where twelfth ranked Redbacks (2-4) edged 9th ranked Flames (3-2) 96-93 on Friday. Redbacks forced 21 Flames turnovers. Strangely Flames outrebounded Redbacks 51-21 including a 22-3 advantage in offensive rebounds. They looked well-organized offensively handing out 24 assists. Guard Marshall Nelson (188-94, college: Wayland Baptist) scored 24 points and 8 assists to lead the charge for the winners and guard Jayden Coburn (191-97) chipped in 24 points during the contest. Four Redbacks players scored in double figures. The best for the losing side was forward Greg Hire (201-87, college: Augusta) with a double-double by scoring 30 points, 14 rebounds and 6 assists and power forward Chudier Pal (205-91, college: UNC Asheville) produced a double-double by scoring 18 points, 10 rebounds and 4 assists. Both coaches tested many bench players in such tough game. Redbacks moved-up to eleventh place in League. Loser Flames dropped to the fifth position with two games lost. Redbacks will face league's second-placed Buccaneers in Wonthella in the next round and they do not belong to the favorites in that game. Flames will play on the road against Giants where they are definitely not considered as a favorite in this game either. Not a big story in a game in Floreat where 11th ranked Magic (1-4) was rolled over by seventh ranked Hawks (3-2) 120-73 on Friday. Hawks made 18-of-19 free shots (94.7 percent) during the game. Hawks had a 37-22 advantage in offensive rebounds. They looked well-organized offensively handing out 35 assists comparing to just 8 passes made by Magic's players. The former international forward Ben Purser (200-90, college: Augusta) had a triple-double by scoring 10 points, 10 rebounds and 11 assists to lead the charge for the winners and swingman Cooper Hamilton (192-98) chipped in 28 points during the contest. Four Hawks players scored in double figures. The best for the losing side was American guard Shaun Stewart (183-94, college: Limestone) with 18 points and 8 rebounds and his fellow American import forward Marvin Smith (201-93, college: USC Upstate) scored 14 points. Since the result was very predictable, it gave the chance for the coaches to test many bench players and allowed the starting five to rest. Hawks moved-up to sixth place in League. Loser Magic dropped to the twelfth position with four games lost. Hawks will face league's leader Wanneroo in Joondalup in the next round and they do not belong to the favorites in that game. Magic will play on the road against Senators (#10) in Perth and it may be a tough game between close rivals. The game between closely ranked teams ended with top-ranked Wanneroo's (5-0) road victory over second-best Lightning (3-1) 89-70 on Friday. They outrebounded Lightning 46-32 including 17 on the offensive glass. Wanneroo looked well-organized offensively handing out 22 assists. Great defensive blocking was one of the keys in this match when Wanneroo made 8 blocks. Guamanian-American guard Earnest Ross (198-91, college: Missouri, agency: Haylett Sports) had a double-double by scoring 19 points, 10 rebounds and 5 assists to lead the charge for the winners and American swingman Ridell Camidge (192-96, college: Oklahoma City) chipped in 24 points during the contest. The best for the losing side was forward Joshua Davey (198-0) with a double-double by scoring 16 points and 13 rebounds and guard Rowan Mackenzie (188-99) scored 13 points. Five Lightning players scored in double figures. Both coaches tested many bench players and allowed the starting five to rest. Wanneroo maintains first position in League with 5-0 record. Loser Lightning dropped to the fourth place with one game lost. Wanneroo will face Suns (#7) in Kalamunda in the next round where they are favorite. Lightning will play at home against Tigers and hope to win that game. There was no surprise in Kalamunda where bottom-ranked Slammers (0-5) were outplayed by ninth ranked Suns (3-3) 108-88 on Friday. Suns outrebounded Slammers 41-30 including 32 on the defensive glass. They looked well-organized offensively handing out 23 assists. Slammers were plagued by 24 personal fouls down the stretch. American swingman Joshua Braun (193-94, college: GCU) had a double-double by scoring 32 points, 11 rebounds and 8 assists to lead the charge for the winners and power forward Louis Timms (206-91, college: Wayland Baptist) chipped in 35 points (!!!) and 9 rebounds during the contest. The best for the losing side was American-Irish Brian Voelkel (196-92, college: Vermont) with a triple-double by scoring 14 points, 11 rebounds and 13 assists and American guard Michael Lay (179-84, college: Concordia, OR) scored 26 points and 4 steals. Four Slammers players scored in double figures. Both coaches tested many bench players and allowed the starting five to rest. Suns moved-up to seventh place in League. Loser Slammers still closes the standings with five games lost. Suns will face league's leader Wanneroo in Joondalup in the next round and they do not belong to the favorites in that game. Slammers will play at home against Cougars (#13) and look forward to get finally their first victory. No shocking result in a game in Willetton where fifth ranked Tigers (3-3) outleveled 7th ranked Eagles (3-3) 110-88 on Friday. They outrebounded Eagles 40-29 including 30 on the defensive glass. Tigers looked well-organized offensively handing out 34 assists comparing to just 18 passes made by Eagles' players. Guard Jackson Hussey (190-92, college: Pikeville) scored 30 points and 7 assists to lead the charge for the winners and American forward Maurice Barrow (196-92, college: Fairfield) chipped in 23 points, 10 rebounds and 5 assists (on 8-of-10 shooting from the field) during the contest. The best for the losing side was guard Sunday Dech (196-94, college: Barry) with 22 points and 4 assists and American guard Cameron Williams (185-95, college: MSU Denver) scored 18 points. Both teams had four players each who scored in double figures. Since the result was very predictable, it gave the chance for the coaches to test many bench players and allowed the starting five to rest. Despite that victory Tigers went down to eighth position (League) due to points difference. Tigers will face higher ranked Lightning (#4) in North Lake in the next round and it may be quite challenging game. Eagles will play at home against Slammers (#14) and hope to win that game. Very expected game in Wonthella where bottom-ranked Cougars (0-4) were crushed by second ranked Buccaneers (4-1) 107-68 on Saturday. Buccaneers dominated down low during the game scoring 76 of its points in the paint compared to Cougars' 40. They outrebounded Cougars 54-35 including a 36-23 advantage in defensive rebounds. American-Tongan guard Marcus Alipate (182-92, college: St.Thomas) scored 23 points, 8 rebounds and 6 assists to lead the charge for the winners and American forward Colter Lasher (201-94, college: Houston Baptist) chipped in 17 points and 6 rebounds during the contest. Five Buccaneers players scored in double figures. The best for the losing side was forward Jaarod Holmes (198-94) with 19 points and guard Steven Van-Lit (184-91) scored 13 points and 8 rebounds. Since the result was very predictable, it gave the chance for the coaches to test many bench players and allowed the starting five to rest. Buccaneers maintains second position in League with 4-1 record behind leader Joondalup W. Loser Cougars still closes the standings with four games lost. Buccaneers will face Redbacks (#11) in Northbridge in the next round and are hoping to win another game. Cougars will play on the road against Slammers in Bunbury and look forward to get finally their first victory. Quite upsetting was Eagles' home defeat in a game versus Giants 120-110. Giants shot 31 for 43 from the free-throw line, while Eagles only scored fourteen points from the stripe. They outrebounded Eagles 50-38 including 18 on the offensive glass. Giants looked well-organized offensively handing out 32 assists comparing to just 19 passes made by Eagles' players. The best player for the winners was American swingman Jay Bowie (196-92, college: Marist) who scored 36 points (!!!) and 9 rebounds. Forward Manylok Malek (201-94) chipped in a double-double by scoring 19 points, 12 rebounds and 5 blocks. At the other side the best for losing team was American guard Cameron Williams (185-95, college: MSU Denver) who recorded 28 points and swingman Jordan Wellsteed (194-95) added 13 points, 8 rebounds, 5 assists and 5 steals respectively. Four Giants and five Eagles players scored in double figures. Both coaches used bench players which allowed the starters a little rest for the next games. Giants maintains third position in League with 4-2 record behind leader Joondalup W. Loser Eagles dropped to the ninth place with three games lost. Giants will meet at home Flames (#5) in the next round. Eagles will play against Slammers (#14) and hope to secure a win. Rather predictable result in Bunbury where twelfth ranked Redbacks (2-4) defeated bottom-ranked Slammers (0-5) 91-84 on Saturday. Guard Marshall Nelson (188-94, college: Wayland Baptist) scored 25 points, 9 rebounds and 5 assists to lead the charge for the winners and power forward Isaac Gattorna-Hargrave (203-99) chipped in 16 points and 7 rebounds during the contest. Redbacks' coach used a ten-player rotation and allowed the starting five to rest. The best for the losing side was American swingman Tyler Livingston (198-94, college: UMass Lowell) with a double-double by scoring 37 points (!!!) and 12 rebounds and American-Irish Brian Voelkel (196-92, college: Vermont) produced a triple-double by scoring 10 points, 15 rebounds and 13 assists. Five Redbacks and four Slammers players scored in double figures. Redbacks moved-up to eleventh place in League. Loser Slammers still closes the standings with five games lost. Redbacks will face league's second-placed Buccaneers in Wonthella in the next round and they do not belong to the favorites in that game. Slammers will play at home against Cougars (#13) and look forward to get finally their first victory. There was an upset in Perth where higher ranked Tigers (3-3) were defeated by tenth ranked Senators (2-2) 89-80 on Saturday. Senators made 17-of-19 free shots (89.5 percent) during the game. They also forced 21 Tigers turnovers and outrebounded them 39-26 including a 29-18 advantage in defensive rebounds. American guard Justin King (196-89, college: TRU) had a double-double by scoring 23 points and 10 rebounds to lead the charge for the winners and forward Caleb Davis (206-95, college: Saginaw Valley) chipped in 25 points and 7 rebounds (went 7 for 7 at the free throw line) during the contest. Five Senators players scored in double figures. The best for the losing side was guard Damien Scott (192-92) with 36 points (!!!) and 7 rebounds and American forward Maurice Barrow (196-92, college: Fairfield) scored 14 points. Both coaches tested many bench players and allowed the starting five to rest. Senators maintains tenth position in League with 2-2 record. Loser Tigers dropped to the eighth place with three games lost. Senators will face Magic (#12) in Mandurah in the next round. There was a surprise result in Rockingham where ninth ranked Flames (3-2) beat higher ranked Giants (4-2) 96-91 on Sunday. Flames looked well-organized offensively handing out 24 assists. Guard Luke Travers (197-1) scored 16 points, 6 rebounds and 5 assists to lead the charge for the winners and American guard Caleb White (201-94, college: ECU) chipped in 21 points during the contest. Five Flames players scored in double figures. Flames' coach used a ten-player rotation in such tough game. The best for the losing side was American swingman Jay Bowie (196-92, college: Marist) with a double-double by scoring 25 points, 10 rebounds and 4 assists and swingman David Humphries (193-91, college: Loyola Mary) scored 24 points, 7 rebounds, 5 assists and 6 steals. Flames moved-up to fifth place in League. Loser Giants keep the third position with two games lost. Flames will face again higher ranked Giants (#3) in Kalgoorlie in the next round and it may be quite challenging game. The game between closely ranked teams ended with bottom-ranked Spiders' (0-6) road loss to tenth ranked Panthers (3-3) 77-88 on Saturday. Panthers forced 20 Spiders turnovers. They looked well-organized offensively handing out 22 assists. Guard Benjamin Kearins (188, agency: MKP Management) scored 19 points, 9 assists and 4 steals to lead the charge for the winners and forward Sean Weekes (194) chipped in 14 points and 9 rebounds during the contest. The best for the losing side was Daniel Moser (, college: Northwestern, IA) with 20 points and 5 rebounds and Matthew McElhone produced a double-double by scoring 14 points and 10 rebounds. Both coaches tested many bench players and allowed the starting five to rest. Panthers moved-up to seventh place in League. Loser Spiders still closes the standings with six games lost. Panthers will face league's second-placed Norths Soul Sports Bears in Crows Nest in the next round and they do not belong to the favorites in that game. Spiders will play at home against Maitland Mustangs (#3) and look forward to get finally their first victory. No shocking result in a game in Terrigal where top-ranked Crusaders (5-0) outleveled bottom-ranked Newcastle Hunters (0-5) 92-62 on Saturday. Crusaders dominated down low during the game scoring 54 of its points in the paint compared to Newcastle Hunters' 34. Crusaders forced 21 Newcastle Hunters turnovers and outrebounded them 44-30 including 17 on the offensive glass. They looked well-organized offensively handing out 25 assists comparing to just 12 passes made by Newcastle Hunters' players. American forward Mitchell Rueter (198, college: Cent Arkansas) scored 23 points and 7 rebounds to lead the charge for the winners and forward Callum Jenkins chipped in 14 points and 7 rebounds during the contest. Crusaders' coach felt very confident that he used 11 players and allowed the starting five to rest. The best for the losing side was American forward Sharif Watson (198-93, college: Ariz.Christian) with 22 points and 7 rebounds and his fellow American import power forward Lonnie Funderburke (203-88, college: Tennessee St.) scored 10 points and 9 rebounds. Crusaders maintains first position in League with 5-0 record. Loser Newcastle Hunters still closes the standings with five games lost. Crusaders will face league's second-placed Norths Soul Sports Bears in Crows Nest in the next round and it will be for sure the game of the week. Newcastle Hunters will play on the road against Manly Warringah Sea Eagles (#4) in Narrabeen and look forward to get finally their first victory. Rather expected game when 7th ranked Sutherland Sharks (2-3) were defeated at home by fourth ranked Manly Warringah Sea Eagles (4-2) 83-73 on Saturday. Manly Warringah Sea Eagles shot 22 for 31 from the free-throw line, while Sutherland Sharks only scored six points from the stripe. Sutherland Sharks were plagued by 27 personal fouls down the stretch. Guard Kevin White (189-87, college: Alaska-Anch.) scored 22 points and 7 rebounds to lead the charge for the winners and guard Steven White (182-90, college: Alaska-Anch.) chipped in 20 points and 6 assists during the contest. The best for the losing side was American forward Taj Spencer (201, college: CBU) with a double-double by scoring 25 points and 14 rebounds and Lochlan Hutchison scored 25 points and 5 rebounds. Both coaches tested many bench players and allowed the starting five to rest. Manly Warringah Sea Eagles maintains fourth position in League with 4-2 record. Loser Sutherland Sharks dropped to the ninth place with three games lost. Manly Warringah Sea Eagles will face Newcastle Hunters (#11) in Broadmeadow in the next round and are hoping to win another game. Sutherland Sharks will play on the road against Bankstown Bruins in Condell Park and it may be a tough game between close rivals. There was a surprise result in Alexandria where ninth ranked Sydney City Comets (3-3) defeated one of their biggest challengers Hills Hornets (3-2) 88-71 on Saturday. Sydney City Comets made 17-of-21 free shots (81.0 percent) during the game. Sydney City Comets outrebounded Hills Hornets 39-27 including 25 on the defensive glass. They looked well-organized offensively handing out 23 assists comparing to just 9 passes made by Hills Hornets' players. Naturalized American guard Indiana Faithfull (193-91, college: West Liberty) scored 22 points, 6 rebounds and 5 assists to lead the charge for the winners and Alex Overs chipped in 9 points, 9 rebounds and 9 assists during the contest. The best for the losing side was naturalized British forward Paul Brotherson (198-89, college: MSU Denver) with a double-double by scoring 12 points and 10 rebounds and guard Mitchell Brown (196) scored 8 points, 6 rebounds and 4 assists. Hills Hornets' coach tested ten players seeing no chance for a win. Sydney City Comets moved-up to sixth place in League. Loser Hills Hornets dropped to the fifth position with two games lost. Sydney City Comets will face Bankstown Bruins (#10) in Condell Park in the next round. Hills Hornets will play at home against the league's leader Crusaders (#1) and hope to win that game. Not a big story in a game when 6th ranked Canberra Gunners (2-3) were rolled over at home by second ranked Norths Soul Sports Bears (5-1) 100-53 on Saturday. Norths Soul Sports Bears dominated down low during the game scoring 58 of its points in the paint compared to Canberra Gunners' 26. They outrebounded Canberra Gunners 48-29 including a 35-20 advantage in defensive rebounds. Norths Soul Sports Bears looked well-organized offensively handing out 28 assists comparing to just 11 passes made by Canberra Gunners' players. Anatoly Bose had a double-double by scoring 23 points, 14 rebounds and 4 assists to lead the charge for the winners and guard Nick Blair (185-87) chipped in 26 points during the contest. The best for the losing side was center Darcy Malone (213-95, college: CS Fullerton) with 8 points and 8 rebounds and Shaun Mills scored 7 points and 5 rebounds. Since the result was very predictable, it gave the chance for the coaches to test many bench players and allowed the starting five to rest. Norths Soul Sports Bears maintains second position in League with 5-1 record having just one point less than leader Joondalup W. Loser Canberra Gunners dropped to the eighth place with three games lost. Norths Soul Sports Bears will face league's leader Crusaders in Terrigal in the next round and it will be for sure the game of the week. Canberra Gunners will play on the road against Sutherland Sharks (#9) and it may be a tough game between close rivals. Everything went according to plan in Hornsby where fourth ranked Manly Warringah Sea Eagles (4-2) beat bottom-ranked Spiders (0-6) 79-64 on Sunday. Manly Warringah Sea Eagles forced 21 Spiders turnovers. Cooper Wilks scored 16 points and 8 rebounds to lead the charge for the winners and guard Kevin White (189-87, college: Alaska-Anch.) chipped in 9 points, 7 rebounds, 6 assists and 5 steals during the contest. The best for the losing side was Jack Larkins with 7 points, 7 rebounds and 7 assists and Lachlan Woodhill scored 16 points. Both coaches tested many bench players and allowed the starting five to rest. Manly Warringah Sea Eagles maintains fourth position in League with 4-2 record. Loser Spiders still closes the standings with six games lost. Manly Warringah Sea Eagles will face Newcastle Hunters (#11) in Broadmeadow in the next round and are hoping to win another game. Spiders will play at home against Maitland Mustangs and look forward to get finally their first victory. There was no surprise when 8th ranked Bankstown Bruins (2-3) were defeated on the road by fifth ranked Maitland Mustangs (4-2) 90-79 on Sunday. Maitland Mustangs dominated down low during the game scoring 68 of its points in the paint compared to Bankstown Bruins' 44. American forward Isaiah Ellis (203-95, college: Chico St., agency: Interperformances) had a double-double by scoring 22 points and 12 rebounds to lead the charge for the winners and Terrell Turner chipped in 24 points during the contest. The best for the losing side was forward Jack Lopez (196-94, college: Montana) with 14 points and 4 assists and Stefan Erak scored 12 points and 7 rebounds. Both teams had four players each who scored in double figures. Both coaches tested many bench players and allowed the starting five to rest. Maitland Mustangs moved-up to third place in League. Loser Bankstown Bruins dropped to the tenth position with three games lost. Maitland Mustangs will face Spiders (#12) in Hornsby in the next round and are hoping to win another game. Bankstown Bruins will play at home against Sutherland Sharks and it may be a tough game between close rivals.